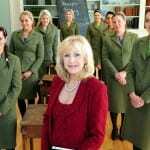 Last week Sarah and I conducted an interview over Skype with Liz Brewer, the Etiquette and Social Protocol teacher in the T.V series ‘Ladette to Lady’. Liz, who has two books published, spoke to us concerning her opinions on local accents when working in the business industry. Talking to Liz, it became clear that she has a love for local accents, but stressed they can become a problem if they are difficult to understand. Thank you very much to Liz for taking part, it was a great interview which we thoroughly enjoyed!